These are little parcels full of flavour and yumminess. The keema( minced lamb) is so succulent and juicy .I make these a lot as they are a huge hit in my elder daughters class , she takes tiffins full of these piping hot treats and they are gobbled up within seconds . Have them with your evening tea or carry them for picnic u could even reduce there size and serve them with cocktails they are a hit everywhere.If you prefer make them with chicken mince just put a dollop full of green chutney or a nice cucumber greek yoghurt dip on top of them and dig in! though i love to eat them with ketchup .Actually i eat a lot of things with ketchup (my girls have stopped eating ketchup but i just love it they think its childish to have ketchup , well i don’t think so it has got nothing to do with age if u like it u just like it one can’t stop eating things that they enjoy just because they r getting older) . If you don’t make anything else just make the mince ,add a handful of peas to it and you will get a very popular dish called keema matar. Have it with plain chapati or a naan it is really delicious. To make the pastry , combine the flour and salt in a large bowl . Make a well in the centre and add the oil and 5-6 tbsp of warm water (add more water if the mixture seems too dry) Knead with your hands for 5-7 minutes to make a smooth dough. Cover with cling film and keep aside. Heat the oil in a large non-stick pan and add the chopped onion , grated ginger and garlic . Fry until the onion begins to brown slightly around the edges (stirring often) then add the coriander powder , cumin powder and chilli powder stir well and add the mince and increase the heat to medium-high .Stir the mince until it is lightly browned and completely dry . Pour 200 ml of warm water and bring the mixture to a boil .Cover with a lid and let it simmer for 20-25 minutes. Remove the lid and add the tomato puree ,cream and salt give your pan a good stir and let it simmer for 10-15 minutes or until done .Stir in the garam masala and add the finely chopped chillies and fresh coriander leaves mix your mixture thoroughly and remove from heat. Taste and adjust the seasoning , then transfer to a wide bowl and leave it to cool completely. Divide the pastry into equal balls and then roll it out to a circle of about 15cm . Cut each circle into two equal halves .Working with one semi-circle at a time brush the cut edge of the semi circle with water and form a cone shape ,sealing the edge . 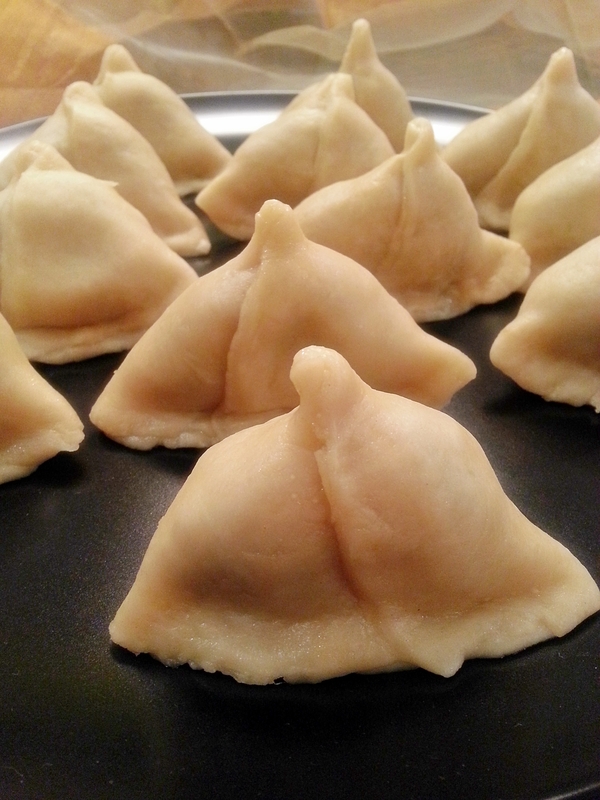 Fill each of your cone with yummy filling (don’t fill it to the top, leave 1cm of space from the top ). Brush the pastry edges with water and press together to seal the cone . Preheat the oven to 200 degree centigrade. 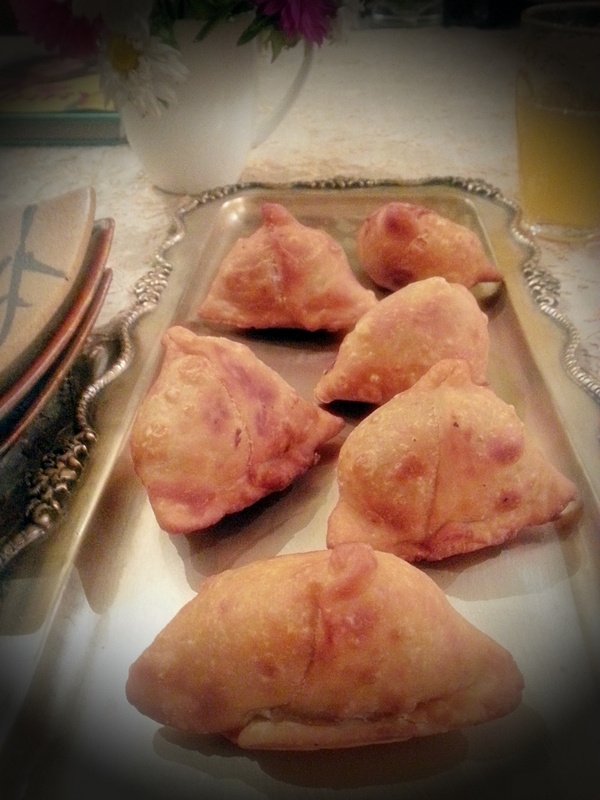 Brush the samosas all over with a little oil or melted butter and arrange on a lightly oiled baking tray . 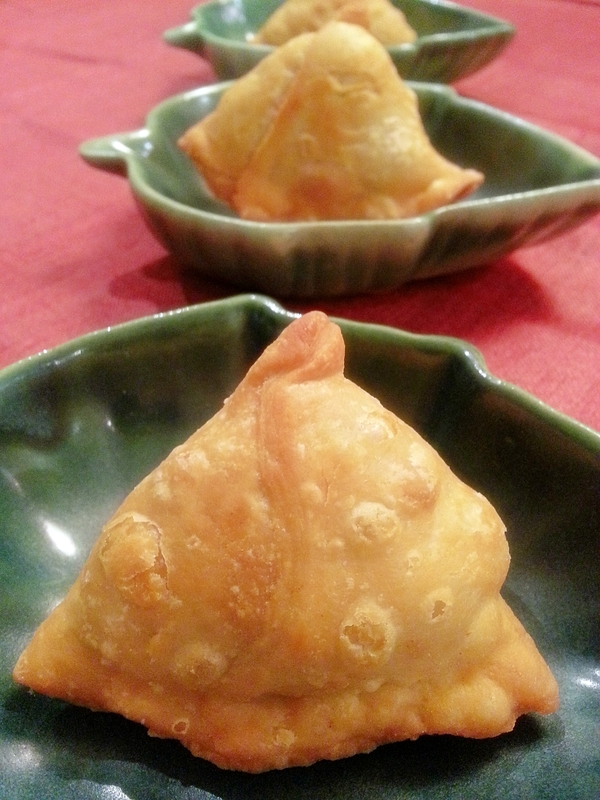 Bake the samosas for 15-16 minutes until golden brown and the pastry is crisp. Remove from the oven,cool for a few minutes and serve while they are still hot. Wow, I can’t believe those samosas are baked—they look like they’ve been fried! I love the idea to brush them with oil/butter and bake them. They look delicious!